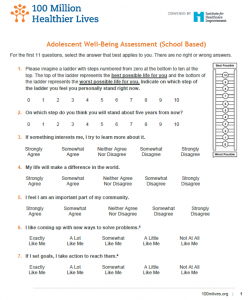 LWK disseminated a Youth Wellbeing Assessment to the four high schools in Kershaw County to determine overall health and wellbeing status of its priority population. Indicators from the survey captured overall well- being, cognitive well-being, meaning and purpose, social well-being, emotional well-being, and physical well-being. All four high schools completed this survey for a total of 1,229 responses. There is an estimated 3,150 high school students in the county for a survey response rate of 39%. The LWK team has stratified the results by zip code, grade level, race, and gender to provide student leaders with a starting point for targeted interventions addressing baseline results to then measure improvement of indicators overtime.